Virtually inexhaustible reserves of high purity calcium carbonate. Continuous improvements and latest technology in machinery and production processes. Building long-term business relationships based on reliability, service and mutual trust. Aggregates and sands with different gradings and specifications. Micronized with required sieve by the customer. High purity calcium carbonate. Average up to 98% content of CaCO3. Products for use in manufacturing plants as aggregates, correcting sands with various sieves and limestone filler. Families of armourstones and drainage material. Selected blasts and aggregates. Also core materials. Company structure and values favour long-lasting customer relationships, based on trust and reliability. All mobile machinery used in mining is owned by Canteras de Santullán. Stable, experienced and highly qualified staff, basic pillar of our company. We do continuous and systematic investments in improvement of production processes. Exports from the port of Bilbao are certified and analyzed by S.G.S. 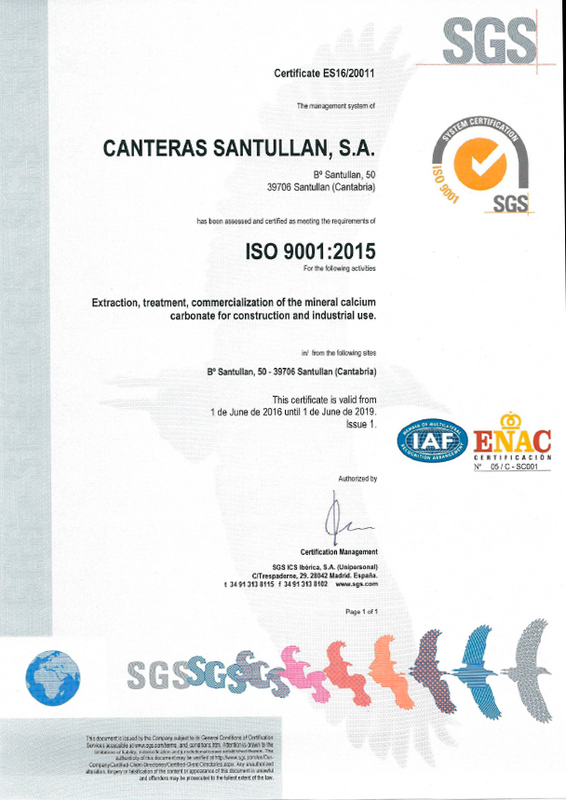 To contact Canteras de Santullán S.A. we provide a contact page and a form where answer your questions. We will answer as quickly as possible.